The level cap has been raised to 75. To proceed beyond level 70, the final level cap quest "Shattering Stars" must be cleared. Quests to gain new weapon skills have been added. Various new quests have been added. Several regions that were previously unavailable in the Expeditionary Force system can now be chosen. New target monsters have been added to these areas for the Expeditionary Force missions. Expeditionary regions will include areas that you have visited but are not under the control of your nation or your ally nation. When participating in an expeditionary force you will now be able to trigger the appearance of the target	monsters an unlimited amount of times. This is changed from the previous restriction of only once a week. Individual conquest points rewarded for a successful expedition have been adjusted. 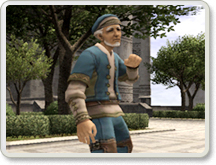 A high-ranking priest of the cathedral in Northern San d'Oria has returned from a trying pilgrimage. The location of the "???" mark in the quest "Whence Blows the Wind" has been changed. A new key item that allows you to pass through the Moongate in Ro'Maeve at any time has been added. With the raising of the level cap, the skill cap for each combat skill has been increased. The system for calculating the effect of the "Shield Bash" ability has been adjusted. The chance for evading a Shield Bash will be uniformly lowered regardless of an enemy's level. This adjustment makes the ability stronger at lower levels and weaker at higher levels. The accuracy of physical attacks for high-level characters has been increased. The party experience bonus for certain high-level monsters has been increased. While using the job ability "Manafont", black mages will no longer have their spell casting interrupted when taking damage. However, spell casting will still be affected by status effects such as Stun and Silence. Upon activating the samurai job ability "Meikyo Shisui", TP will automatically be raised to 300%. The summoner job ability "Astral Flow" will now last for three minutes. Also, while the ability is in effect the MP cost for maintaining an avatar will be reduced to zero. "Sneak Attack" will now only be successful when performed from directly behind an enemy. The positioning for "Trick Attack" remains unchanged. "Resist" job traits and songs for increasing resistance have become more effective against incredibly tough opponents. Furthermore, the message "Resist!" will now be displayed in the log window when these traits and songs successfully resist an attack. Resistance enhancing meal effects will also be treated in the same way as described above. Adjustments have been made to the "Killer" job traits and "Circle" abilities. Previously, these abilities had a "Haste" or "Slow" effect. However, now when a monster is attacking a PC with the appropriate "Killer" job trait or a PC under the protection of a "Circle" ability, the creature is occasionally intimidated and unable to attack, similar to the "paralyzed" effect. The message "(Monster) is intimidated by (Character's) presence" will appear in the log window when the effect takes place. "Killer" meal effects will also be treated in the same way as described above. In relation to these changes, the "Circle" abilities will now last for one minute and will be available for use once every ten minutes. Spell and song effects such as Reraise will now be canceled when changing jobs. The use of Cure V is now restricted to white mages only. Temporarily blinds an enemy, greatly lowers its accuracy. Grants you the effect of Raise III when you are KO'd. Temporarily prevents an enemy from acting. Deals lightning damage to enemies within area of effect. Enhances target party member's ranged attack accuracy. Grants Reraise to party members within area of effect. Enhances target party member's Dexterity. *Has no effect inside ferries, airships, or dungeons. Enhances target party member's Strength. Summons an Earth Spirit to fight by your side. The skill chain attributes for "Tachi: Gekko" have been changed. New notorious monsters have been added to several areas. The number of hit points for Orcs has been readjusted. The movement speed of the Behemoth and the King Behemoth has been increased. A knock-back effect has been added to several monster attacks. The distance a character is knocked back by certain existing monster attacks has been adjusted. The best clear time for each battlefield will now be displayed along with the time limit for the battle. The skill cap for synthesis skills has been raised to 100 (Veteran). New synthesis recipes have been added for each type of skill. Rank 9 conquest items have now become available. Also, the number of conquest points required to purchase "Instant Warp" and "Instant Raise" has been halved. The amount of time taken for treasure chests to reappear will now be random within a set time frame. Treasure chests will now reappear a short time after a trap has been set off by a thief failing to open a chest. A new member has joined the Troupe Valeriano: a Mithra that bundles sets of arrows together so they take up less inventory space. She will group a set of 99 arrows or bolts of certain types into a single "quiver." These quivers can be stacked in groups of twelve, essentially allowing you to carry twelve times the number of arrows. The new gardening item "tree saplings" is now harvestable from "tree cuttings." Accordingly, the number and types of items harvestable from "tree cuttings" have been adjusted. New items have been added for logging and mining. Also, hatchets, pickaxes, and sickles will break more easily when used repeatedly at the same point. The prices for meals have been adjusted. The status issues concerning the behemoth knife and behemoth knife +1 have been addressed. The status issue concerning the phantom earring has been addressed. The help message issue concerning the darksteel maul and the darksteel maul +1 has been addressed. Mog House functions have been expanded with the addition of the "Storage" menu item. Furniture placed in your Mog House using the Layout command gives you access to extra storage space separate from your Mog Safe, accessible though the Storage menu. The new text command is "/storage". Using this command outside of your Mog House allows you to see what items you have in Storage. The Storage menu is handled in exactly the same way as the Mog Safe, but items stored in furniture can only be accessed from your Mog House. The Storage menu is unavailable at Rent-a-Rooms and when using the Nomad Moogle service. The camera position for the "/sit" command has been lowered to the eye level of the sitting character. The camera angle and degree of zoom will now remain the same when changing areas and after logging out. Pressing the Zoom In and Zoom Out keys at the same time will return the camera to the default setting. The scale of the map will also remain the same after logging out. The level restriction for riding chocobos in the three main nations has been decreased to 15. In order to ride a chocobo at level 15, it is still necessary to acquire a chocobo license in the same way under the same conditions as before the update. However, the amount of riding time for characters lower than level 20 will be shortened. The window for the auto-translation function will change size automatically to accommodate the length of different words and phrases. It is now possible to return to previous categories when using the auto-translation function. New phrases have been added. The phrase "Please" has been changed to "Yes, please." Words and phrases taken from the auto-translation function will have their beginnings and endings clearly marked when displayed in the log window. Operates scroll bar of selected window. *Some mice do not have wheels. held down will cause your character to run in that direction. Deselect menu item or targeted object. Clicking the right mouse button a second time will cancel Autorun. down will move the camera in that direction. cause the camera to rotate in that direction. cause your character's view to rotate in that direction. A dialogue box for the number of sound effects that can be played simultaneously (SoundEffectNum) has been added to the configuration tool. The new items that were to be added as rewards for the current avatar battles (Trial by Ice etc.) that were mentioned in the development announcements, will now be added at a later date. -The character limit has been exceeded for the names of some items. These names may appear difficult to read under certain circumstances. -There are instances where the additional effects of certain giant monsters' double attacks are not properly displayed in the log window. -When using the auto-translation function on the PlayStation 2 version, it is possible to return to previous categories with the Esc, Backspace, and Delete keys. When using the Windows version, however, this is only possible with the Esc key.